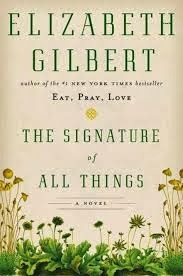 The Signature of All Things by Elizabeth Gilbert was a novel that featured great prose from Gilbert on an interesting subject and may have been a bit longer than I would have liked, but definitely finished strong. In terms of the overall plot, there's excellent reviews out there that describe it, like that by Clare McHugh for the Wall Street Journal and what struck me from the book was both the description (including a cave scene that brought to mind a somewhat similar setting in the Bryce Courtenay book The Power of One) and a piece of the story that was introduced towards the end. The primary character in the book was named Alma and tremendously interesting to me was a scene where she fought off drowning, and then had that serve as a partial foundation to her writing an unpublished treatise very much in line with On the Origin of Species that was being written by Charles Darwin. Also interesting on this topic was Alma's struggle with how human behavior that goes against the idea of natural selection (or competitive adaptation) relates to the concept written on separately by herself, Darwin and another. Back to the scene in which Alma had to fight to survive, it brought to mind past writing that I found to be excellent. The late public policy expert John Gardner (who I wrote about in 2009) wrote (among many other things) about carrying on in the face of adversity and Esquire writer Mike Sager in a piece on mental heath (which I wrote about in 2011) provided the powerful and true words "how much can one man take? As much as need be."